Chairman of the newly rebranded Eugene F. Correia Airport Michael Correia on Monday delivered a feral blast at Director of the Roraima Group of Companies Captain Gerald Gouveia over his stern and persistent objections against the renaming of the Ogle International Airport, in recognition of Guyana’s first Public Transport Minister, whose surname coincides with that of those individuals who own majority of shares in the company. The proceedings commenced with a fiery speech by the Airport’s Chairman, who used the opportunity to set the record straight by lashing out at Gouveia and all the other operators who opposed the renaming. “Correia”; nonetheless, he expressed gratitude that the administration went ahead with the initiative despite the protests mounted by the National Aircraft Transport Association (NATA), an organisation consisting of nine of the ten aircraft operators working out of the now Correia Airport. The Airport Chairman argued that Roraima Airways and all the other operators who are contesting the renaming have contributed little or nothing to its development but are yet cashing in on the investment he and his family have made. “Roraima Airways, to use as an example, has recently expanded its building and its fleet of aircraft with a reported investment of US$2.5 million. But what has Roraima Airways contributed to the investment in the Airport? The total private investment of Roraima Airways in this Airport is US$83,000 by comparison, or 2.2 per cent of the total equity in the Airport,” he disclosed in portraying that Gouveia and the others have no right to make an objection. 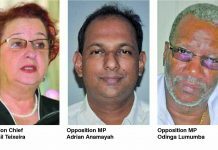 He went on to highlight that Gouveia, in his cries, is simply ridiculing a decision taken by two of the most accomplished aviators: former Director of Civil Aviation Anthony Mekdeci and former Chief Pilot of Guyana Airways Corporation Malcolm Chan–a–Sue, both of whom are senior managers of the Airport. “Why is Gouveia trying to tear down the good name, and damage the reputation of these national icons, who have helped to make him in his career, and who have made Ogle International Airport the envy of the Caribbean,” Correia stated. Subtly taking a swing at those operators who objected to the name change, he contended that “self-interest”, “greed” and “jealousy” appear to rule the day. President David Granger in his address, also made it clear that he was not lobbied for the Airport to be renamed but rather, it was a genuine decision he took to recognise the contributions of great Guyanese to the development of the country. “I was not coerced, I was not lobbied. It was simply to recognise the character of the man,” he said. 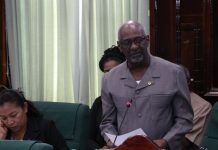 Granger also made it clear that his administration’s decision to ignore the calls for a reversal of the decision is not a show of dictatorship since the Airport’s Board already granted permission for the undertaking. Further justifying his decision, the President chronicled extensively the sterling contributions and achievements made by Correia. 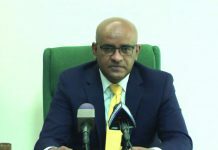 Moreover, Public Infrastructure Minister David Patterson described Correia as a son of the soil whose record every Guyanese should be proud of. Addressing concerns over the name change, Patterson once again assured that the Airport’s functions and operations will remain the same. “This airport will still provide a means for those in hinterland communities to bolster economic activity; this airport will still provide a link for access to key services; this airport will still impact lives in big ways,” he stated. The operators who opposed the renaming of the Airport complained that this act will give an unfair advantage to the Correias. 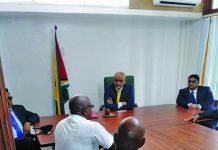 In November last, the operators vented frustration over the anti-competitive nature at the facility being practised by the company that runs the airport. “The Correia Group controls the Airport and has increased the cost of fuel; monopolised ground handling and other services and arbitrarily terminated tenancy contracts with the apparent aim of forcing us out,” the operators had expressed. Against this backdrop, the operators are now fearful that the renaming of the Airport to “Correia” will only add to the long list of problems they endure on a daily basis.